WataugaWatch: Will Watauga County Appeal Its Board of Adjustment Decision in the Maymead Case? Will Watauga County Appeal Its Board of Adjustment Decision in the Maymead Case? Word is filtering out that Watauga County Attorney "Four" Eggers was first suggesting to his bosses that they don't have standing to appeal their own Board of Adjustment decision in the case of Maymead Asphalt, and then he changed his tune slightly and began saying that it would be highly unusual for a county to appeal to superior court a decision by its own Board of Adjustment. Both of those suggestions are incorrect. What's not at all unusual is that the commissioners appointed every one of those members of the Board of Adjustments and those members follow the Republican line of "you can't tell a feller what he can and can't do on his own property. My property rights ABOVE your rights to health, safety, and the enjoyment of your investment in hearth and home." Those property rights chickens are now roosting on the commissioners' porch railing. And they have a decision to make Tuesday night, at Commissioner John Welch's insistence that they consider appealing the decision of the Board of Adjustment in the Maymead Asphalt plant on the Doc & Merle Watson Scenic Highway. Concerned about the cost of an appeal, are they? Where was their concern about legal expenses when they voted to intervene in the Town of Boone's lawsuit against the state in protecting its right to Extraterritorial Jurisdiction? In November 2014, in his last meeting as a member of the Watauga County Commission, Chair Nathan Miller voted to spend unreported amounts of taxpayer money to intervene in the Boone ETJ case in advance of a hearing by a three-judge panel (which Boone won, incidentally). Miller was joined in that vote by fellow Republican commissioners Perry Yates and David Blust. Miller is gone from the commission, where he delighted in punishing the town of Boone for its very existence. But Yates and Blust still sit up there making decisions that affect the health and safety of large numbers of citizens, and the future for all of us. If they take bad legal advice from "Four" Eggers and/or if they refuse to pursue their legal rights in the interests of protecting the citizens, then hell may be cool compared to the fury of voters in November. Maymead pursued the Hampton lease in the first place as it found itself between a rock and a hard place: the rock of public road contracts already awarded and underway, and the hard place of the ever-changing strictures of what Boone and Watauga would allow re routing trucks to complete those projects. And in the scheme of things, Maymead is one of the far-lower-impact players. Tourism and business need roads. Road projects voted on and funded need to be finished. Nothing prevents Watauga from finding ways, moving forward, to protect what it wants to protect. It looks like the usual suspects protecting the usual things though: Eggers egging everyone to fight legally-made decisions he doesn't agree with to the death, and as always using public money to fight for the "protection" of the Watauga "environment", which here, yet again, looks like rich folks' houses and wounded-pride interests. Excellent points, Anon 11:47 AM. I agree. First, there are TWO existing asphalt plants to service the 221 project - one in Boone and one in Ashe County. A third asphalt plant is being built by Radford in Ashe county - next to a camp for terminally ill children (can't make that up people!) Radford also continues to find legal support for its interest in building an asphalt plant on Rainbow Trail property - so its trucks can zoom by Hardin Park (a school with no sidewalks). If all goes as planned, there will three asphalt plants in Watauga County and two in Ashe County. We simply don't need that. The idea that "rich folks' houses" are the reason for the fight - those are dog-whistle words. The wealthy are the people who own the Maymead land and stand to make a KILLING if Maymead decides to buy it. (Maymead is just leasing right now, FYI, and the lease for the asphalt plant site expires at the end of 2017.) The people who OWN the land at stake - 104 acres on the Doc & Merle Watson Scenic Byway - their identity is hidden in a secret trust based out of South Carolina. Wiley Roark, president of Maymead, spent $1.6 million for a permit he could have obtained legally without any legal issues. WHO are the rich people being protected by the BOA's decision? Not the local homeowners. Not at all. So stop sprouting that nonsense. Property values diminish when an asphalt plant moves into the neighborhood. Avery County lost tax dollars due to the need to devalue property values when Maymead built its Pineola facility. Neighbors lost big - as did the county in lost tax revenues. Tourism needs a beautiful gateway too. Building an asphalt plant - with potential for quarry and cement facilities as well - is very, very poor strategy for a county that depends on tourism. Watauga County will definitely pay a significant price for this reckless decision to transform the gateway to a multimillion tourism business into a heavy industrial zone. If you think Watauga County homeowners deserve protection from the impact of unregulated heavy industrial development - if you think the county should stand by its county planner's decision - if you think the county should support the very strong legal case made by the attorney hired by the county to defend the county's decision to revoke an old and expired permit, come to the Commissioners hearing on Tuesday, 2/16 at 5:30 in the County Building. Your voice matters. Do you know what is highly unusual? A BOA tossing the county planner under the bus after the county paid a good deal of money to present a solid case to support the county planner's decision to revoke an expired permit. The county commissioners should vote unanimously to support the county's decision to uphold county and state law regarding high impact development in the county. They need to send the BOA's ill-considered decision (they deliberated for a matter of just minutes) to Superior Court. This needs to be determined in a court of law. What we witnessed with the BOA's ruling was well-scripted theater - determined well in advance and behind closed doors. There are very strong grounds for the county commissioners to appeal their own BOA's decision in the Superior Court and support the county planner's decision to revoke the expired permit. Many citizens of this county hope they do so. Throughout the hearings, the BOA members had dinner and conversed with Hampton and Maymead's counsel and their paid witnesses. If the BOA hearings were meant to be "quasi-judicial," the fact that the BOA repeatedly dined with the petitioners and their witnesses compromised the legal integrity of these hearings. It is difficult to vote against people you are friends with. That's one reason why the county's evidence needs to be heard in a court of law. The BOA members are not trained in law. They ignored the county's clear and valid evidence that showed "no vested interest" in the development of asphalt production. The BOA also ignored the county's evidence that sworn testimony of Maymead's witnesses differed significantly from written documents provided by those same witnesses. That is a cause for grave concern. The BOA members took just moments to come to their decision, which made their decision seem emotional and capricious rather than based in findings of fact. Commissioners have expressed concern about the costs of this hearing. The fact that the county is spending money intervening in the ETJ issue needs to be brought up with the commissioners this Tuesday night. Why is the county actively spending money trying to diminish the protections for homeowners in this county when it should be spending money to support the county's decision revoke a permit that expired due to no appreciable progress in the years since the permit was issued? Maymead has a "right of refusal" to purchase a 104 acres at this site. The next question is who has a financial stake in the adjoining 81.691 acres owned by the South Carolina registered LLC's "Gateway Crew, LLC" and "Summer Tract, LLC?" The ownership of these LLC's remains hidden from public view at this point. If this asphalt facility is allowed to go forward on the Doc and Merle Watson Scenic Byway, it will have terrible repercussions for the aesthetic and health standards of this county. No longer will we welcome people to the High County. Our identity will become: "Welcome to Watauga - Asphalt Producer to the High Country!" This permit is being transferred and sold illegally and the county commissioners need to stop this travesty. I for one do not want to see the beauty of our High Country transformed into an industrial zone, evoking images of West Virginia and Harlan County, KY.
How does one find out who are the members of the county BOA. It doesn't seem to be through the county website. Realize folks, Maymead has provided jobs in this area for many years. To Anon @ 5:30 - The BOA members are volunteers nominated for this position by the county commissioners. Frankly, I don't think ANY of them signed up to provide quasi-judicial rulings on important matters! The news articles on the ruling may post their names. I'm not sure. Clearly, the members of the board are friends with the people suing the county. BOA members dined frequently with the Maymead and Hampton folks throughout the long hearing. The county commissioners really need to defend the county's position in this case - and appeal this to the Superior Court so that it is decided by a court of law, not friends of the petitioners. Anon @9:56 PM, the jobs they create are very few and financially insignificant to our community compared to the destructiveness they will create with their illegal purchase of the expired asphalt permit. They have not acted in good faith trying to build on a spot that the permit did not cover, hoping the county would not notice. They are also lying about their "vested interest" in this project as per the county attorney's evidence. They are disingenuous and will never be good neighbors. The commissioners need to shut the door on this out of state corporation. This case before the BOA is about the legality of a permit transfer, not jobs. There have been five HILU permits issued in Watauga County. Five. This particular permit is being transferred in a highly unusual way - years after it was issued for land that was never developed as per the HILU permit. Additionally, this permit was sold by Johnny Hampton and bought by Wiley Roark - Roark's words. He was in Florida and someone told him about that HILU permit up in Watauga County - so he hightailed it to Watauga and bought it. Why didn't Roark apply for his own permit? It's a mystery. But clearly, he wanted to remain outside of the purview of the county's regulatory process. That's very wrong. And that is very very dangerous precedent set by the BOA - they did not question Roark's statement at all - and ruled AGAINST THE COUNTY in favor of an out-of-state company's ability to purchase a HILU permit years after it was issued. Allowing the sale of a HILU permit changes the Watauga County regulatory process without the benefit of the regulatory process. That's far outside the boundaries of what the BOA is supposed to do. That's why this case needs to be heard in a court of law. And if you want to talk about jobs - let's talk about the $200 million tourism industry that benefits Watauga County in many ways. Building a massive asphalt/cement/quarry facility at the gateway to the High Country is very damaging to a very important industry to Watauga. Jobs will be lost when that that massive asphalt plant starts up. Who wants to cavort amidst high impact development while on vacation? No one. At year's end, there is a very good chance that Watauga County will have THREE asphalt plants. This small, rural county will be able to go head to head with Buncombe County (pop. 250,000), which also has three asphalt plants. VERY poor planning on the part of Watauga County leadership. It is troubling - the idea that a company can act outside of the county's regulatory process because it offers a few jobs. If you want to talk about JOBS, why not just ask the hotels, the restaurants, the chamber, TDA, and the ski slopes, tweetsie etc that depend on tourism in our beautiful mountains. Is an asphalt plant at the entrance to our community helping or hurting that image? Would it bring in jobs or cost us jobs? Not only does this ancient permit get a bypass from the setback requirements of the new HILO, but also the screening and buffer requirements along the highway. Yuck. Perhaps all that money flowing into our county will pull-over, stop, and take a picture of that time when the watauga county republicans sold us out to the pavement company from Tennessee. They changed the law so I am under the impression that they don't want to leave that impression as their legacy. Then again, there are too many back-room connections going on in this deal. How did a 2-year permit turn into a 5 year permit? Why did the county sign off on the air permit application meeting local standards, then flip the same month to drop their old building permit? A unanimous BOA with short deliberation? Hard to imagine it is that clear cut when it seems so fishy. The BOA process was incredibly flawed. Incredibly flawed. Board members repeatedly dined during the hearing with the people suing the county. A board so intent on wrapping up the job that they deliberated just moments before overturning the county's very solid case. If the county does not appeal this case to Superior Court - so it can be considered in a court of law instead of by friends of the petitioners - perhaps residents should start asking WHY Commissioners are taking orders from Wiley Roark, instead of their constituents. This whole thing is not passing the smell test. Lucrative acreage in a blind trust, available for Maymead to purchase. An illegal transfer of an old HILU permit. An out-of-state company that didn't even initially lease the area that was permitted for the asphalt plant - and who initially planned to build the plant on land NOT permitted by the county. Perry and Yates are up for reelection this fall - if you feel homes and property values matter - and need protection from unregulated development, make sure they know that. Vote them out. Yesterday at 5:13 p.m. I asked a simple question: who are the members of the county BOA? Can no one provide an answer other than they are some folks who schmooze with Maymead, et al. Obviously, they are volunteers who have been appointed by the Commissioners, but the county website no where provides information as to who they are. Is this some kind of conspiracy to hide these people? I guess one could research the Commissioners' minutes, but it seems reasonable for them, like other such bodies, to be identified. You k now, basic transparency. I thought the owner of this blog was committed to transparency, but maybe he doesn't know them either or can't provide information as to their identities. 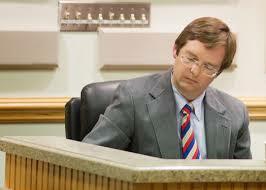 I understand that Baxter Palmer served on the Board as alternate during the recent hearings in place of Ms. Janet Beck. Janet Beck did not serve at the recent Maymead hearing. The others were the ones involved in the "quasi-judicial" hearing - they are the ones who, throughout the hearings, dined frequently with the people suing the county. These men are volunteers and quite frankly, I don't think any of them ever realized that they would be involved in a hearing of this nature. That's why the evidence needs to be presented in a court of law.